After one of the busiest months I've had in my career, I had a few days of downtime before more scheduled shoots. So I decided to finally put together a small product shoot I had wanted to do for quite some time. The plan for this shoot was long in the works, but the time to do so didn't exist. I had wanted to practice my liquids/ product photography skills for a while, ever since watching Rob Grimm (RGG Photo) on CreativeLive many months back. 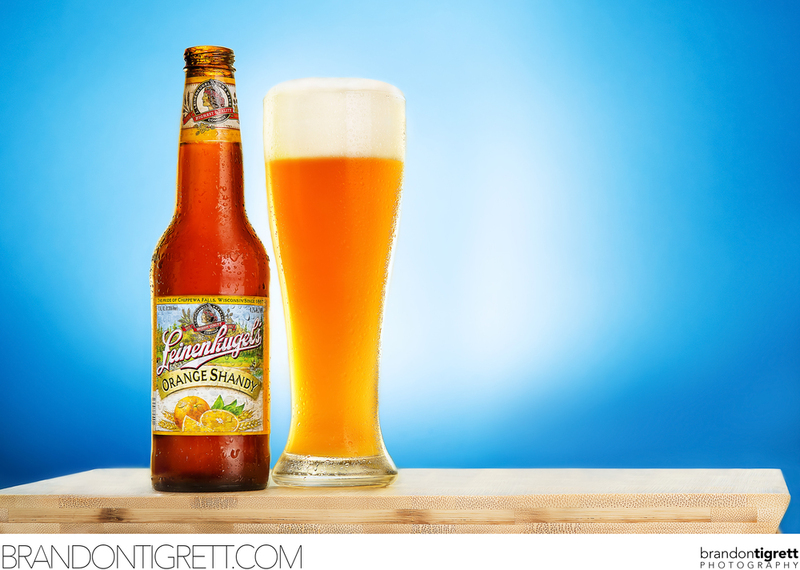 So having bought the winter sampler pack of Leinenkugel beer back in January in order to get credit towards tickets to the Phoenix Waste Management Open, I just needed the time and inspiration to crank out a product shoot. One of the problems I encountered during this shoot was my lacking of lighting to make a shot like this in one shot. I own 2 Lumopro LP180 flashes. After watching Rob Grimm put his shoot together with $20,000 in Broncolor lights, I was skeptical I could pull it off with ease. Correct in my thinking, it wasn't easy. But it was sure as hell fun! I spilled copious amounts of beer on myself, got really thinking and tinkering with how I could bounce my 2 lights off of gold cards, and our small apartments white walls to get the perfect highlights I envisioned in my mind. Because I lacked the gear to pull of this shot all at once I had to rely on a predetermined vision for how it should look. Then make sure I shot for different parts of the bottle and glass and somehow pull it all together in post. Luckily this wasn't my first attempt at something like this, so my photoshop document was a lot better organized than my first go at a composite. Overall I'd say it was a good learning experience, a ton of great practice, and honestly I came out of it with a solid photograph and portfolio piece! Here's the final image.